32 pc. Potted Orchid Assortment [CPT3] - $320.00 : Hawaiian Tropicals Direct, Farm-Fresh Tropical Flowers Delivered Direct to You! Great for party table decorations for weddings, Christmas or any special occasion! 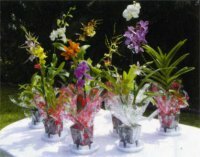 Assorted blooming orchid plants in 4 inch pots each with a colorful pot wrap, flower spike staked and held with a decorative clip, and a White Saucer Stand to securely support the plant on the table. Plants make excellent awards or gifts after the party!